What's The Difference Between Skydiving And BASE Jumping? Many people think that BASE jumping and skydiving are the same thing. Though they both involve parachutes and jumping into the air, the two extreme sports vary in key ways. Here are some of the differences between the two. Want to jump out of airplane? Skydiving, also known as parachuting, is an extreme sport that involves a flight into the skies before you leap into the clouds. Skydiving usually occurs at a height of around 13,000 feet. Skydiving can be done solo or in a tandem jump where you're strapped to the front of a trained professional. A first-time jumper will usually participate in tandem skydiving. 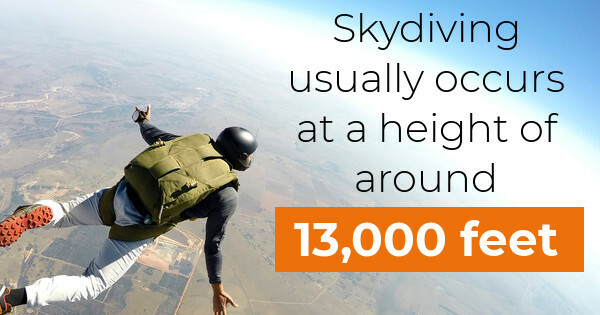 If you're up for an adventure, you might be able to handle the 120 mph freefall to the ground before you rip your parachute cord. You're only in freefall for about 60 seconds before pulling your first parachute, which then opens the second chute. Then you float leisurely to the ground over the course of the next five minutes and take in the scenic views. Skydiving is an incredibly safe activity. BASE jumping is actually an acronym, standing for Building, Antenna, Span, and Earth. Unlike skydiving, BASE jumpers leap from tall objects. While a building is fairly self-explanatory, the other categories might cause some confusion. An antenna refers to the large radio towers you might see looming above open spaces. A span refers to a structure that spans a large gorge, like a bridge in the Grand Canyon. Earth refers to any monolithic spaces, including mountains, canyons, or cliffs. These are the types of jumping off points a BASE jumper uses to plunge into the air. Unlike skydiving, BASE jumping is incredibly dangerous. Many BASE jumpers are injured when they jump too close to the ground. Others have fallen to the wingsuit trend that gives the jumper a false sense of security. While skydiving is legal and is regulated by the United States Parachute Association, BASE jumping usually involves bending or breaking the law. Now that you know the ins and outs of skydiving and BASE jumping you can destroy your friends at the next trivia night. If you're interested in skydiving yourself, you can jump out of airplane by contacting Jump Florida Skydiving today. Here, you can even get a video and commemorative photos of your first-time jump. Contact us by phone or online today for more information.